• Roosevelt Ingram, 36, of 132 Normand Ln. 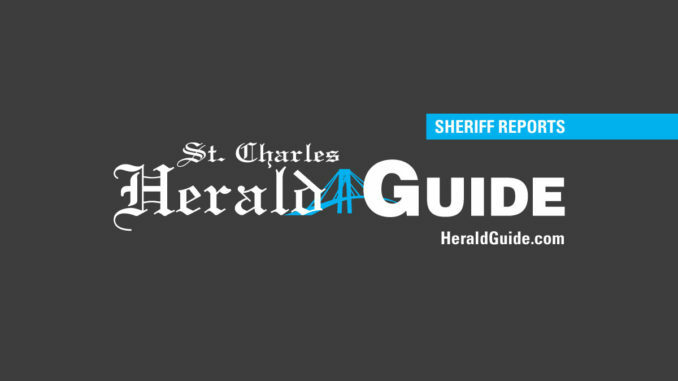 in Des Allemands was stopped for a traffic violation on March 14 and charged with possession of stolen things, resisting arrest by refusing to ID, driver not licensed and motor vehicle needed two headlamps. • Kyle D. Gonzales, 26, of 108 Oak Alley in Mandeville was arrested on March 16 on 1-310 and charged with D.W.I and reckless operation of a motor vehicle. • Marc A. Smith, 37, of 2437 Frankston in Tyler, Tx was arrested March 15 on 1-10 and charged with D.W.I. and improper control of a motor vehicle. •Darius L. Smith, 27, of 7912 Macon St. in Metairie was arrested on March 16 on U.S. Hwy 51 and charged with D.W.I, improper control of a motor vehicle, no insurance and an SCSO attachment. • Roark E. McGarry, 46, of 1335Long St. in Lakeland Fla. Was arrested on March 13 and charged with D.W.I, hit and run and failure to yield. • Jairo H. Jiminez, 28, of 115 Augustin Ln in LaPlace was arrested on March 15 while on U.S. Hwy 61 and charged with D.W.I., driving in roadway lane of traffic, speeding, driver not licensed and an SCSO attachment. • Arthur W. Martin, 46, of 900 Kinler St. in Luling was arrested on March 11 after being stopped for a traffic violation and charged with possession of crack cocaine, public and violation of probation/parole after further investigation. • Rondell Capote, 23 of Jumonville St. in New Orleans was arrested on March 11 after being stopped for a traffic violation and charged with possession of heroin with intent, prohibited drug paraphernalia and obstruction of justice after further investigation.